‘I thought of an interview with the writer Reynolds Price. Price…was asked what his greatest gift as a child had been. He said his favorite gift had come from his grandmother. She had told him a story. Reynolds Price’s grandmother compared life to a traffic light. She explained that the light stays green for a long time, but eventually it turns yellow, and you have to slow down. And then the light turns red, and you have to stop. And wait. Spending the past 2 1/2 years with cancer trying to take center stage in my life has taken its toll on me. Since my first diagnosis in 2014, I’ve been fighting cancer as best as I could, refusing to let it change me. I continued to design gardens throughout my treatment, continued to write articles for various publications and spoke to over a dozen garden clubs (with my bald head wrapped in a scarf, feeling sick most of the time.) Surprisingly enough, I had my most successful year (financially speaking, at least) while going through chemo. I recently had my 2-year check up (a huge milestone with my particular aggressive type of cancer), and all the tests were negative – hooray! But even after getting the double thumbs-up from my doctors, with their encouraging ‘go forth as usual and live your life…’ I’ve realized that there is no more ‘as usual’ for me. This past year I’ve felt like Mrs. Potato Head, trying to pick up the pieces. It’s like everything fell off and I’ve been trying to put things back again: growing my hair back, reconstructing my breasts, tattooing my eyebrows back on my face since they decided to take a permanent leave of absence. But after everything is said and done, the fact remains – I’ve permanently changed. And I haven’t been able to shake the ever-present feeling that it’s time to move forward. For someone like myself, who’s steeped in memories everywhere (after all, I live in my childhood home) moving forward is a particularly difficult concept. While it’s easy for me to stay right where I am, where it’s safe and secure, I’ve had this nagging sensation that something is missing. One thing I’ve always been good at is listening to my heart and the little voice in my head. So over the past year, I’ve made a conscious effort to reduce the distractions in my life so I can listen very carefully. What it’s all boiled down to is simple – to be near my family. I’m not the only one, either. My husband, daughter, and parents have also spent the past year taking a close look at what’s important to them, and we all agree that living near one another is a top priority. So, as difficult as this is, it’s time to say goodbye to my home in Los Altos and create a new future a few hours north of here. The few people I’ve told so far are shocked, and invariably exclaim ‘but how can you leave your garden?’ But you know what? It’s not as hard as I thought it would be. It’s time. It’s time to pass it along to someone new who will create their own memories here. I have an amazing realtor, who happens to also be a very close friend, who assures me we’ll find the perfect buyer who will cherish this home as much as I have, and I can’t wait to find out who they’ll be. I imagine new, young children falling in love with their garden, making their own discoveries, making their own memories. Embarking on this new adventure with my husband is exhilarating to me. The thought of having my parents nearby, being able to stop by on a whim or have regular dinners together makes my heart sing. And while my daughter can’t guarantee where her life will take her in the next few years, her goal is to eventually end up living near me. The thought of all of us together makes my heart swell with happiness. I’ll continue my design business (as well as writing and public speaking), driving to the Bay Area every few weeks or so, focusing on consulting and working on select projects. But my goal will be to have a bit more free time to work in whatever new garden lies ahead. It’s time for me to blossom again. I hope you’ll continue to join me in this new adventure, filled with new gardens to create and new memories to make. Your honest, heartfelt words touched my heart, but then, your writing is always so wonderful. You are right. That is why I live in SLO, just to be close to my family and to treasure every moment, every meal, every shared joy or sorrow. We love and appreciate you and look forward to coming adventures. Rebecca, I am so happy for you. I know you have been discerning your new path for a while and it seems like you have made a wonderful choice. How exciting! I wish you all the best in this next phase of your life. Selfishly, I am glad to read that you aren’t really leaving your admirers in Los Altos. I don’t like to think of saying good-bye to you forever! Happy nesting and gardening in your new home. You deserve all the best. Just as an aside, our new front yard enjoyed the best welcome to the world with all of the lovely rain this winter. Things are thriving! I’m so happy I met you through the Phase 3 group and have been so inspired by your beautiful design work. I truly believe that the big decisions we make which are inspired by that little voice inside usually lead to the most wonderful experiences. Hi Holly – and thank you so much! I’ll admit that inner voice is a little shaky right now with our open house coming up in a few days, but all I have to do is imagine my future with my family so close by and I feel much more calm. Since I’ll be spending a significant amount of time down here with my clients and friends, I hope to see you again soon at a Phase 3 meeting! Somewhere there is a new garden just waiting for you to step into it and make it your own. A garden that needs you! As someone whose parents have both passed away, I tell everyone and anyone you will never regret the time you spend with your parents when you are an adult. Being close to them will be wonderful! Best wishes as you go forward with this new green light. I hope our paths will cross again sometime soon! Thank you, Layanee – I appreciate it! That is so much hard work, to constantly fight for normalcy over the past few years, so what you have accomplished is astounding. I’m thrilled to hear the good news. After so much happening to you out of your control, it must be so healing to take the reins and say, This is what I most value and this is what I will do about it. Bravo! You’re an inspiration. And I am privileged to have seen your garden, thanks so much for sharing it. Rebecca, I wish you all the best! Thanks for sharing your wonderful, touching stories with all of us. Good luck on your newest adventure! Enjoy! Thank you Helen – yes, a new perspective is right! It’s all about love, isn’t it? My husband and I are looking forward to all the new adventures that lie ahead and having the incredible support from people like you means the world to me. Thank you. Bravo Rebecca. Best to you on your new adventure. You are gonna love it. I did. Wow I’m really excited for you. You are such an inspiration! I live in Roseville, Ca. That is between Gerhard and Granite Bay. I pass there all the time on my way to see my 94 year old father. Happy Trails to you. Dear Rebecca, I know how life-changing a breast cancer diagnosis can be. I have been blessed now with ten years of good reports, and I am thankful for every minute of every day. The concerns never go away, but I fill my mind with happy thoughts and nurturing activities. One of the highlights is your Blog which warms my heart and provides inspiration to do better things with my sad, gopher-ridden garden. I keep planting and trying my best to overcome the beasts. As long as hope is there, I gain pleasure from communing with the soil and planting a riot of colored flowers and beautiful foliage. The rewards are plentiful. It sounds like you are making this move for all good reasons and I’m sure you will create a lovely, personal garden at you new home. Enjoy, best wishes, and God speed! When it’s time you know it. Your post moved me, Rebecca, because of all you’ve been going through but also because you’re ready to start a new adventure, and that’s always a little scary but also super exciting. So I wish you good luck with the move, and I look forward to reading about your future garden (as I’m certain there will be one), and I know it will be a beautiful reflection of you and your spirit. Go, girl! Dear friend… now I know why you have been on my mind constantly for the last few months. We are on the same path. I don’t know about you but once I made the decision to leave my gardens I have felt no regrets. I’ve always said to myself that when I can no longer do my gardens justice they will give me permission to say goodbye. The time is right even though I am still filling in a few holes for the summer… even though Laurel and Jim laugh at me and just shake their heads! and I am positive we are on the right path. Hugs! When I read your own FB post I wanted to quickly pick up the phone and call you, but I just couldn’t fathom telling people quite yet. It’s been a journey, that’s for sure. But reading about your own decision gave me a little boost of encouragement, believe it or not, that I can actually do this and the world won’t come crashing down! I’ve only shed a few tears, which must mean it’s definitely time for me to leave. I can’t imagine making this decision a few years ago – funny how our perspectives change. I’m also planting and gardening like crazy – can’t stop myself. I can’t wait to hear about your new adventures, too! It takes time to process a life changing decision, and I’m overjoyed you have given yourself the gift of following your heart. Like you, I couldn’t have imagined making our upcoming move a few years ago, but the time is right and the opportunity to be with my family on a great adventure makes my heart swell. You are now ready to sow the seeds of your beautiful future and it’s going to be amazing surrounded by your beloved family. Much love. I think you are very wise. Here’s the biggest hugs to you Rebecca. You truly inspired me and many others in the garden world. Wishing you the very best and much happiness in your new adventure. Please keep posting your blog and keep us all abreast. Love you my dear friend. Thank you so much, Laura, we’ve certainly had some fun times, haven’t we? Hopefully, I’ll have a bit more free time so I can attend more gardening events and see you – thinking visiting next year’s Succulent Extravaganza at SG is in my future! What a gift it was to see your garden back in 2013. I can imagine how hard it must be to uproot from that, but an exciting and love-filled adventure lies ahead. All my best, Rebecca — may life continue to be Sweet! I have been reading your blog for several years. I wanted to tell you how much your blog has meant to me! I took up gardening, instinctively, 10 years ago after my mom died from pancreatic, liver, and bone cancer. I taught myself how to garden by reading your blog. Gardening healed me! 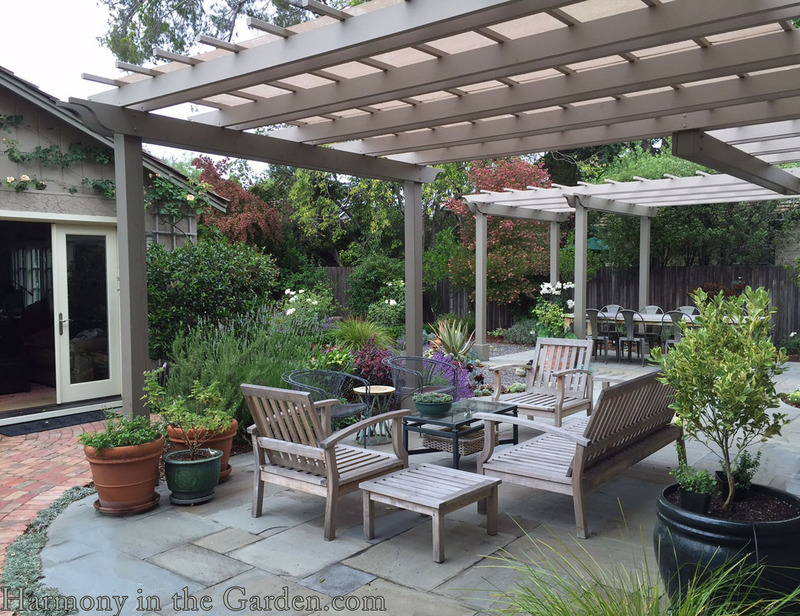 And then, when you wrote, “Refresh Your Garden Design with Color, Texture, & Form,” it totally changed my experience, and I have been having the time of my life and such joy trying to apply the principles. I have commented a couple of times during your cancer journey, my heart went out to you because I understood. A mom is irreplaceable; I am glad that you are going to be with your parents, A beloved garden can be rebuilt, but family cannot be replaced. I have spoken to you through comments, and I know that you find joy in your mom’s garden, as well. I live an hour N. of Sacramento, and I know the small town that your mom lives in, and it is a lovely area. I hope to see you if you ever speak in the Sacramento area. Enjoy your new adventure! I live in Sutter-a small town that is known for the Sutter Buttes. I drive to Roseville about once a week to shop and go to my favorite nurseries. Granite Bay has a new French style bakery that I love called Julian’s. It is on Folsom-Auburn road. You must try the Almond croissants! I am a regular at High Hand, and I really like the Rocklin Green Acres nursery. I hope your mother’s surgery goes well, and she heals, and you have great adventures in your new area. Wow, Rebecca, you are a” go for it girl” in the garden with new plants. You will be glad you made the change——adventures abound for all of you no matter how overwhelming they may seem right now. I wish you the very best and a lovely new garden in a new zone. You always have a place to stay whenever you visit because not only is my/your garden open to you but so is our home. Good for you, Rebecca, and your family. Glad to hear the checkups are negative too. Enjoy your changes and new opportunities. Thank you for the good wishes, Bracey! Rebecca, you continue to be an inspiration – not just in the garden, but in life. Your post gave me a lot to think about. While I’m not ready to make a major move (our younger daughter is still in high school), the thought of what might be next is there in the back of my mind. Priorities change, and gardens–even ones that are built on our blood, sweat, and tears–can go on without us. I’m sending you lots of good vibes for the next chapter in your life. I hope you’ll continue to share it with us through your blog. Rebecca, you’re moving to Granite Bay? That’s about 45 minutes east of Davis. Yes, the climate is pretty similar to Davis, maybe a tad hotter. Beautiful location, though. Would love to show you the UC Davis Arboretum. Let me know what you’re settled. I’d love for you to give me a tour – can you believe I’ve never been there? It’s always been on my bucket list so I’m excited to make it happen! You’re not the only one :-). Please e-mail me when you’re ready for a tour: gerhard@succulentsandmore.com. I don’t usually comment on any of the blogs I read but I just could not let this one go by. I want to thank you for your very generous gift of sharing your story of struggle and survival not only with breast cancer but with the many changes that life throws at us. It is incredibly courageous to put your feelings out there for just any one to read. You have been an inspiration to me and I know to so many others. Thank you and wishing you a bountiful garden in your new home. Sherry, yours is the second comment today that has caused me to tear up with gratitude. Thank you for leaving a comment and sharing your thoughts with me – made my entire day. I look forward to whatever new garden lies ahead for me and can’t wait to share it with all of you! Rebecca, I am so happy to hear that your heart is singing!! Your writing does that for me; and am so very glad that we will be able to see your garden one last time tomorrow! Bless you and much happiness. Four years ago I left the garden that I had spent 27 years creating, to downsize. It was hard at first but am enjoying creating a new (smaller and less thirsty) garden and I Love it! I am sure you will too!! Sometimes change is good. Good luck to you!! Yes, change can be SO good sometimes, can’t it? Thanks for the encouragement. I am so happy for you Rebecca, for your great news that the Cancer tests were negative and for your excitement at the big move and life change. Onward! I look forward to seeing bits of your new garden. Take Courage, my friend. I too am recovering from breast cancer. Working in my garden is my sanity. I am presently in the midst of deciding to move or stay. Thank you, Sandi, and I wish you the very best in peace and health. Rebecca, a part of me feels unworthy responding to your beautifully written piece. I have not had to “live” with a life threatening illness. But, I can empathize with your leaving a garden embued with self. My garden was in Illinois. Aging and plans to spend more time at our home in Florida resulted in a decision to sell our northern home. Cannot tell you how ultimately freeing that decision was. I just recently visited with the couple who bought our home. They have made many changes but clearly love and are tending to what I also loved so much. That said. I am creating a new garden (once a gardener, always a gardener) in Florida. This one is more manageable. My heart goes out to you along with my prayers for your continued wellness. Its great to see you can follow your heart. Rebecca, I hope to see you on Tuesday with the Los Altos Garden Club. When I heard you were moving, My first reaction was ” Oh no, leaving that adorable house and beautiful garden ” my second thought was ” good for her “. I really mean that. I too am in remission from Ovarian, stage 4 cancer. My life is forever changed, and my piororities are so different than 2 years ago. I have had 10 surgeries in under 2 years, but I dress up, put make up on, get my wig straight, put a smile on my face, and out the door thanking God that I have another day to enjoy. What a miracle. My wish for you is to enjoy every minute you have, do the things you want to do, remember NO is a full sentence, and have a ball. I feel so close to you, eventhough I have met you only once before cancer gripped us. Rebecca, I wish you all the very best in your move and in your new home! What town will you be moving to? Will gardening be much different there climate-wise? I hope you do continue your posts, I so look forward to them! Hi Vivian – we’re hoping to move to Granite Bay (haven’t found a home yet) as it’s about 20 minutes from my parents home in Meadow Vista. You live across the lake, right? We’ll be neighbors! I’m somewhat familiar with that area’s climate since my mother has created such an amazing garden in MV (even though they’re hotter & colder), but even so I’m sure I’ll learn some valuable lessons with the summer’s wicked heat. I’ll admit, I’m NOT looking forward to that part of it! But wow – that area is so pretty! It is nice living up here, I live in El Dorado Hills, a close 15-20 minutes from GB. With all the rain we have had my garden is bursting with flowers. My mom said it best once, about this area, “seems like all the plants put on their biggest and best display in Spring, they have to because once Summer comes they practically go into hibernation!” I cannot wait to see and hear about what you do with your new garden here. All the best to you in finding the home and land of your dreams. Beautifully written as always Rebecca. Having family nearby is the most precious gift. Enjoy your new adventure! GO FOR IT Rebecca. I have recently moved from the home and garden we spent 18 years making perfect for us. I loved living there and it’s where our children grew up. But a voice in my head also said it was time to move on and to leave that garden for someone else to care for – or not. It’s been sad at times, and hard to go out into a new ‘garden’ that’s nothing more than patchy grass and some badly pruned shrubs. But we’re already making new small gardens and it feels kind of liberating to not have that huge burden of garden maintenance any more, or the long history of our time in that place. I can completely reinvent how I garden. I wish you well in your new life travels and spending time with your wonderful family. Catherine, thank you SO much for sharing your own story with me. It’s uplifting to me to realize I’m not alone in making a huge decision like this. I really like how you said it’s ‘liberating to not have that burden of the long history in that place.’ While its true that it’s an incredible gift to live where you grew up, in a way it’s also a burden of sorts. I have longed for new adventure for so long and can’t wait for the ‘newness’ of everything. I’m so happy you made the right decision in your own life – gives me hope! Oh Rebecca, good for you for listening to your heart. Ten years ago, after 30 years in Portland, Oregon, I moved to NE Alabama to be near my 92 year old mother, youngest sister and brother-in-law. They had moved there from Florida the year before. I sold the house my grandparents built and left a very small but wonderful garden. Obstacles reared up and melted away. It was a very good decision for many reasons. When it is the right time, all those ties and connections to the current property release us. I’m so glad you have a good Realtor who will find the right buyer for your home. I wish you all the best and all the joy possible in this move. Barbara, you said something just now that made me tear up: ‘When it is the right time, all those ties and connections to the current property release us.’ That’s exactly what’s happened, which is why it’s been so surprising that I haven’t been completely torn up over this decision. Thank you for such a caring and thoughtful response to my announcement. It means a lot to me.